the weather finally broke!. After 7 straight days of 90 degree+ temperatures and similar humidity the storm arrived on Wednesday night followed by a cool front that gave us mid-80's and much lower humidity yesterday. It was certainly good to run for 2-hours in the more pleasant weather after sweating it out big-style for the past week. The bad news was that the storm came right in the middle of the Bowie Baysox game against Harrisburg that we were watching and was called after deciding that the rain, thunder and lightening were not going to let up for continuation (on a side note it took DC United until past midnight to conclude their game against Houston in the MLS!) Luckily the Baysox were winning at the time and since they were in the bottom of the 5th inning, we took the victory and continued the push for the playoffs. We spend many a summer hour watching the local minor league Bowie Baysox (AA Affiliate of the Baltimore Orioles) and have done so since arriving in Bowie in 2004. 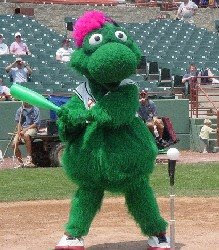 Since that time however, and we have heard this from Baysox veterans much more seasoned than us....what is Louis the Mascot? Most clubs have a mascot that actually resembles something, like an Oriole bird for the Baltimore Orioles, D-J the Bluejay for the Dunedin Blue Jays and Testudo the Terrapin/Turtle for the Maryland Terrapins! Check out the photo below...apart from being green with pink hair, Louis doesn't really resemble anything!